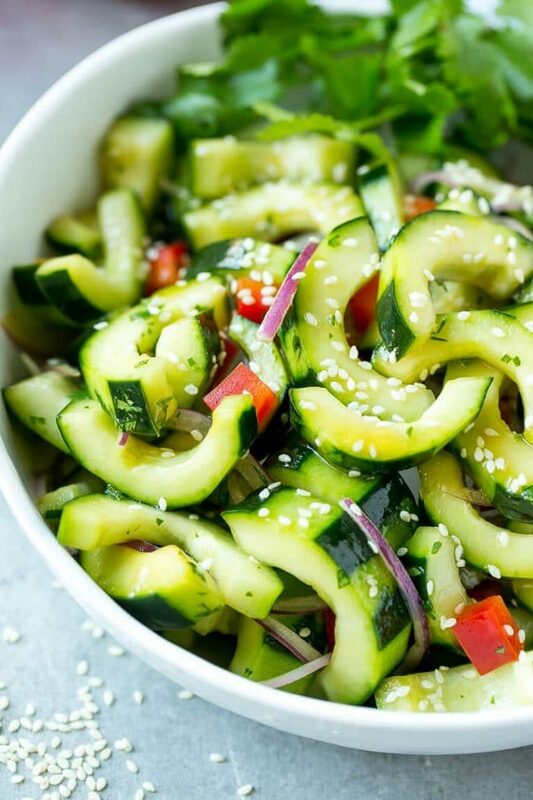 This recipe for Asian cucumber salad is sliced cucumbers and colorful veggies tossed in a zesty sesame dressing. The perfect quick and easy side dish! Who doesn’t love cucumbers? They’re mildly flavored, super refreshing and are amazing in so many different dishes. This Asian cucumber salad is one of my family’s favorite sides, you can serve it alongside grilled chicken or fish and it makes the perfect picnic or potluck offering. The first step for this salad is to select your cucumbers. Typically there are three different types of cucumbers at the grocery store. You’ve got standard cucumbers, the long plastic wrapped English cucumbers, as well as those cute little Persian cucumbers. You can use any of the three types of cucumbers here. I’ve used traditional cucumbers with the seeds removed. If you use English or Persian cucumbers you don’t need to remove the seeds as they tend to be smaller and softer than a traditional cucumber. I run a vegetable peeler around each cucumber to make a striped pattern, which looks pretty and removes some of the waxy skin. The cucumbers are combined with red bell pepper and thinly sliced red onion to form the base of the salad. The dressing is a simple combination of soy sauce, rice vinegar, honey and sesame oil and takes just minutes to put together. Add some herbs and sesame seeds, then toss and enjoy! 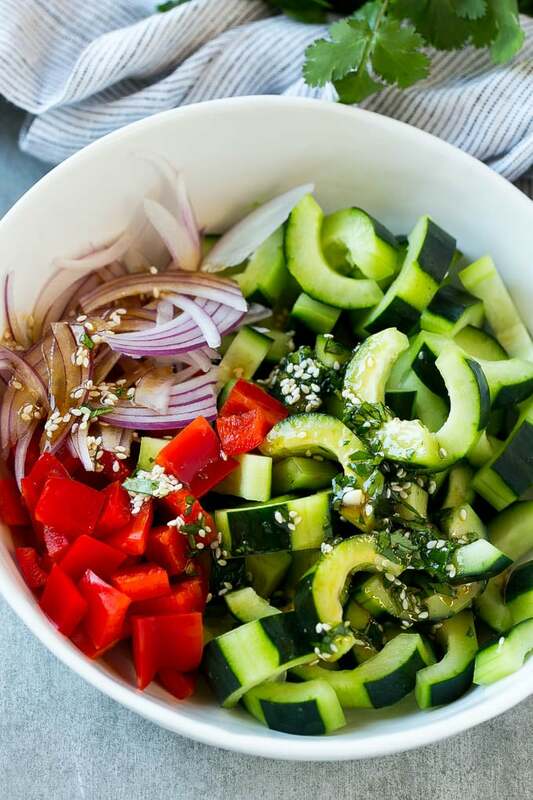 This Asian cucumber salad can be made a few hours in advance, but just be aware that the cucumbers will release liquid as they sit in the fridge, so your dressing might be a little thinner in consistency when it comes time to serve your salad. This recipe is easily customizable, you can add other veggies like edamame, shredded carrots or snap peas, and change up the dressing by adding ginger, sriracha or hoisin sauce. So many possibilities! 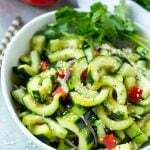 This recipe for Asian cucumber salad is cucumbers and colorful veggies tossed in a zesty sesame dressing. The perfect quick and easy side dish! 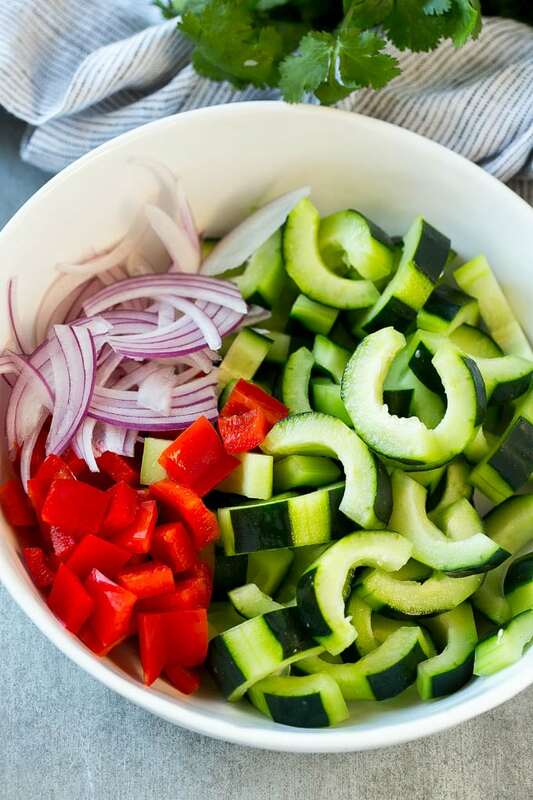 Place the cucumbers, red onion and red bell pepper in a large bowl. In a small bowl, whisk together the soy sauce, rice vinegar, sesame oil, honey, cilantro and sesame seeds. Taste and add salt and pepper if desired. Pour the dressing over the vegetables and toss to coat. Serve immediately or store in the refrigerator for up to 8 hours. This post is sponsored by P.F. 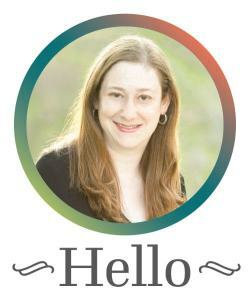 Chang’s Home Menu as part of the Mom It Forward Blogger Network. Thank you for supporting the brands that make Dinner at the Zoo possible. This post was originally published on January 11, 2017 and was updated on March 19, 2018 with new content. 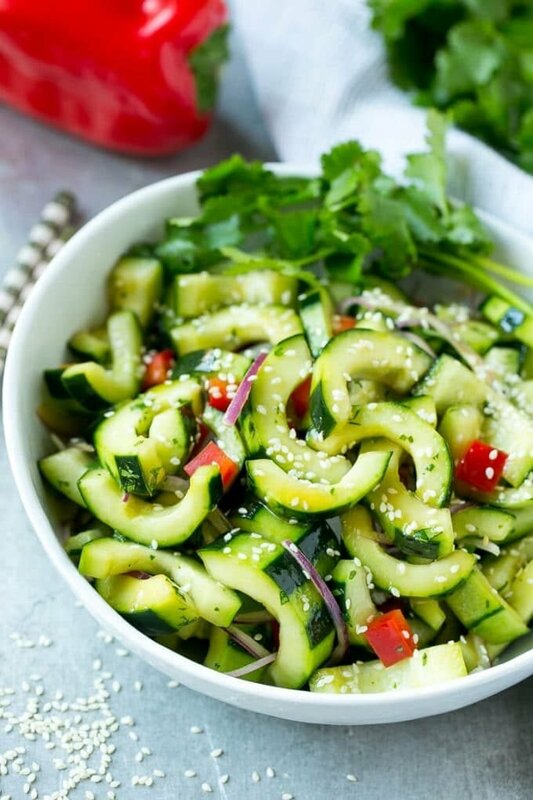 Amazing salad idea with cucumber. Looks so healthy and delicious also. Will try it soon. Love the Asian spin on this. I may have to switch up my tomato cucumber salad with that tasty dressing recipe of yours. Yummy! Been doing cucumber salad before and its usually what I love doing this past few weeks. Adding it a twist from time to time as well. Really one of my healthy foods nowadays. I don’t do cucumbers but man. This salad looks ridiculously fresh and healthy! I love cucumbers because they absorb flavor really well and they go perfectly with different sauces. I think this salad is a keeper especially since it’s refreshing. It can be enjoyed during Spring and Summer and it’s something that I’d make often!